Studio Line: Disney - Brazzle Dazzle Brilliance! Now the fully restored Pete's Dragon is available on DVD! A playful blend of live action and Disney animation, Pete's Dragon is a heartwarming musical adventure filled with thrilling plot twists! Pete, a young orphan, runs away to a Maine fishing town with his best friend -- a lovable, sometimes invisible dragon named Elliott! When they are taken in by a kind lighthouse keeper, Nora (Helen Reddy), and her father (the legendary Mickey Rooney), Elliott's prank playing lands them in big trouble. Then, when crooked salesmen try to capture Elliott for their own gain, Pete must attempt a daring rescue. This collectible DVD contains two delightful animated shorts -- "Lighthouse Keeping" starring Donald Duck, and "Man, Monsters, And Mysteries," a fun look at monster myths, as well as many other wonderful special features. This fun-filled Disney classic, with its Oscar-nominated soundtrack and wonderful story about the value of friendship, is the perfect DVD for the whole family! Academy Awards: Nominated for Best Original Song Score; Best Song-"Candle on Water", 1978. DVD: Widescreen 1.66:1/16x9; audio English DD 5.1; subtitles French; closed-captioned; single sided - dual layered; 24 chapters; rated G; 129 min. ; $29.99; street date 1/16/01. Supplements: "Lighthouse Keeping" Animated Short, Starring Donald Duck, Never Before Available; "Man, Monsters, And Mysteries" Featurette; Excerpt From Disney Family Album Featuring Ken Anderson (Supervisor Of Elliott Character); Still Frame Art Galleries; "Where's Elliott?" The Disappearing Dragon Game. Combine the talents of Helen Reddy, Mickey Rooney, Jim Dale, Shelley Winters, Red Buttons, Charlie Callas, and some unknown little kid, and what do you get? Pete’s Dragon, a fairly joyless, formulaic and dull Disney film from 1977. Egad - look at that cast list again. Did Disney go out of their way to find the most obnoxious and annoying actors in creation? If so, they succeeded, as this grouping grated upon me from start to finish. Granted, I shouldn’t paint my feelings with such a broad brush. Of that group, only Dale, Winters and the kid - long-forgotten urchin Sean Marshall - really actively irritated me. The others seemed fairly tolerable, though the simple existence of Reddy is tough to take. In any case, even if Disney packed Pete’s Dragon with less annoying actors, it still probably would have been a dud. The story tells us about pathetic orphan Pete (Marshall). At the start of the film, he’s on the run from the abusive and cruel Gogan family, headed by mama Lena (Winters). They’ve “adopted” him via a purchase, apparently, and they’re trying to track him down after he’s run away from them. However, Pete manages to give them the slip, so he and dragon friend Elliott (voiced by Callas) attempt to start a life in a quaint New England fishing village. There they meet much resistance from the townsfolk, mainly because clumsy (and often invisible) Elliott accidentally gets Pete into many jams. Pete tells everyone he didn’t do the actions for which he is accused, but no one believes him. Eventually the town drunk Lampie (Rooney) see Elliott, but no one believes him either. Lampie’s daughter Nora (Reddy) takes in Pete, however, and helps him get back on his feet. Of course, complications ensue. Medicinal quack Dr. Terminus (Dale) comes to town with his toady Hoagy (Buttons) and soon learns of the existence of Elliott. Since dragons make for real medicine, he attempts to acquire Elliott in many dastardly ways. Inevitably, the Gogans become involved as well, and Pete faces dire straits. Many movies feature shopworn plots but overcome them; heck, almost every Disney animated film is predictable. However, they succeed through execution, another area in which PD fails. There’s simply nothing special, clever or winning about the film. Marshall is one of the most drab and lifeless movie urchins I’ve seen in a while; he offers no spark or presence on screen. Callas actually brings a fair amount of character to Elliott; the dragon never really speaks but instead uses a semi-nonsensical language of burps and clicks. I never could stand Callas, but I must admit he does a fairly nice job in this underdone role. One of the other reasons PD fails is due to the numerous - and terrible - songs we hear. Many Disney movies feature musical elements, but this one really goes over the top. It felt like there was a new tune every five minutes, and all were uniformly drab and cheesy. It’s true that I don’t care for musicals, but I can respect them to a degree. PD earns no respect in that regard; it’s hackwork at best. Disney’s live-action movies - a category in which Pete’s Dragon belongs despite some cartoon elements - have always felt like poor cousins to their animated siblings, and this one shows why. It seems like the Disney “B”-team gets assigned these pictures, and they falter because of the qualities critics think belong to all Disney flicks; tired stories created with no inspiration. Pete’s Dragon suffers the same fate. It’s a charmless and turgid affair that demonstrates the malaise at Disney in the Seventies as well as anything; between this film and The Rescuers, 1977 may well have been the worst year (in regard to quality, not box office success) ever experience at the studio. 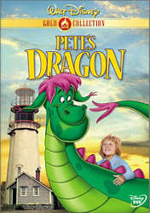 Pete’s Dragon appears in an aspect ratio of approximately1.66:1 on this single-sided, double-layered DVD; the image has been enhanced for 16X9 televisions. While the movie presented a few problems due to the photographic styles, for the most part I thought it offered a fairly attractive picture. Sharpness appeared consistently crisp and well-defined. At no time did I discern any concerns related to soft or fuzzy images, as the entire package came across as accurate. Moiré effects appeared once or twice during the movie - mainly due to the sides of buildings - but I saw no jagged edges. Print flaws cropped up on occasion due to the combination of animation and live action photography. Elliott himself seemed very grainy at times, and other shots in which he appeared also showed heavy amounts of grain. When we didn’t see Elliott, however, the problems became much less significant. I detected a little grit and some speckles, but the other scenes appeared acceptably clean and without defects. Colors seemed similarly erratic, also apparently due to the photographic style. When Elliott doesn’t appear, the images were bright and vibrant. On those occasions, I found the hues to seem accurate and true without problems related to bleeding or noise. As for Elliott himself, however, the colors never quite seemed right. His green skin looked pale, and his purple hair and other attributes seemed too pink. Black levels appeared nicely deep and rich, but shadow detail often came across as excessively thick. Much of this problem occurred due to “day for night” photography; that technique has made many a movie seem too dark, and PD is no exception. Otherwise the shadows were largely fine, but the nighttime scenes were too heavy. Ultimately, the image of Pete’s Dragon has enough going for it to merit a “B-“, but the flaws that result from the integration of animation and live action filming make the movie rather erratic. More consistent though still not great was the remixed Dolby Digital 5.1 soundtrack of Pete’s Dragon. Not surprisingly, the audio stayed mainly in the forward spectrum. Stereo separation largely affected the music, which displayed nice breadth across the front speakers. I also heard modest but pleasant localization of some ambient sounds; nothing blended together terrifically well, but the side channels displayed some minor effects to a useful advantage. The surrounds were minor partners and they offered only general reinforcement of the music and effects; they contributed an acceptably nice atmosphere but didn’t really add much to the experience. Audio quality was dated but generally good. Dialogue had the most problems, as speech often appeared somewhat flat and thin. However, these tones weren’t unexpected for such an old recording, and the lines always were acceptably clear and intelligible. Effects generally displayed similar qualities, but at least they sounded clean and fairly realistic, and they lacked distortion. Music fared nicely, as the movie’s tunes came across as bright and bouncy. The score also displayed some modest but solid bass, as did a few of Elliott’s more guttural vocalizations. Ultimately, the soundtrack showed its age, but I thought it worked well nonetheless. Pete’s Dragon doesn’t offer a packed special edition to compete with elaborate affairs such as the Ultimate Toy Box or the Fantasia Anthology, but it does contribute some extras that keep it in line with other Disney “Gold Classic Collection” releases. We start with “Where’s Elliott? The Disappearing Dragon Game”. Here you respond to verbal puzzles to locate the dragon from a few possible locations. Get four correct and you receive a “special video treat”. Unfortunately, it’s not very special; it just briefly discusses the history of dragons and actually repeats some material found in other extras. “Still Frame Galleries” provides three different areas: “Concept Art” (17 images), “Behind the Scenes” (26 shots), and “Publicity” (14 pictures). These stills are presented in thumbnail galleries that can be easily accessed for larger views. They’re nothing special but I thought they were well-presented and fairly interesting. We find a minor variety of video features. “Family Album” shows an excerpt from a 1982 TV show. This two minute and 22 second clip quickly discusses the career of Ken Anderson, the animator who led the work on Elliott. It’s too brief but I thought it offered a nice enough look at the subject. Another TV snippet comes from “The Plausible Impossible”, a 1956 episode of the Disney show. This excerpt lasts for three minutes and 37 seconds and it discusses the origins or mythological beasts, with a particular focus on - surprise! - dragons. It’s a fun clip that merits a look. PD includes one classic Disney cartoon. We get a Donald Duck short called “Lighthouse Keeping”. This six minute and 42 second piece shows Donald as he battles a pelican to keep the lighthouse lit. It’s not one of Donald’s better efforts but I thought it was fairly entertaining. “Man, Monsters, and Mysteries” is a 25-minute and 15-second program from 1977. It’s a semi-factual affair that discusses the nature of mythological beasts through the years, with a particular focus on the Loch Ness Monster. A little of the piece is animated, but most of it features live action footage. It’s a moderately interesting piece but nothing terribly compelling. “Trailers” offers two different ads. We get the “International” promo and also the “Theatrical” version. The use for the former is unclear, but it seems to be from after the movie’s initial release, since it refers to the film as a “classic”; even Disney aren’t arrogant enough to call something a classic on its initial issue! Lastly, the DVD provides “Film Facts”. This feature includes five screens of basic production notes about the movie. As usual, PD offers a series of ads at its start. Here we find promos for the video release of Dinosaur, Lady and the Tramp II: Scamp’s Adventure, The Hunchback of Notre Dame II. These can be easily skipped via the “menu” button on your remote. Pete’s Dragon can also be easily skipped if you avoid this DVD. The movie is largely a dud; it offers a dull and predictable tale that features virtually no spark or energy. The DVD provides erratic but generally good picture and sound plus a nice little complement of extras. However, the weak quality of the feature can’t be overcome; this one’s for Disney die-hards only.